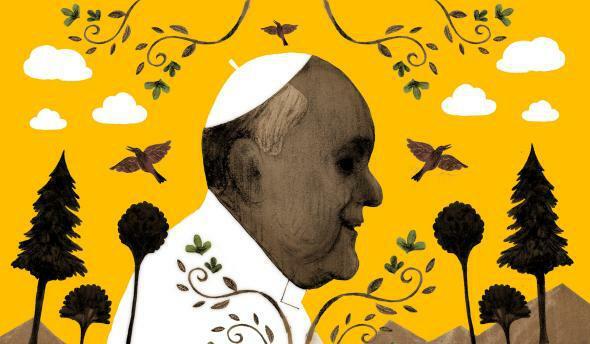 Pope Francis encyclical on the environment and climate change: It’s great, but not as revolutionary as you think. Catholics in America a have a long tradition of looking out for Mother Earth. Pope Francis’ landmark encyclical on the environment, formally released at 6 a.m. Thursday at a press conference featuring a cardinal, a Greek Orthodox theologian, and the atheist head of the a German climate research group, has been in the works for more than a year. And, although an Italian draft was leaked earlier this week, the only real information available beforehand was its basic subject matter. That didn’t stop pundits from opining blind. Progressives hailed the pope’s “anticapitalist revolution,” with a Brazilian climate group releasing a trailer depicting the pope in a Rocky-style training montage. Meanwhile, Peggy Noonan fretted in the Wall Street Journal that the Vatican might be making a scientific error along the lines of the one it made with Galileo, and one conservative columnist denounced it months in advance as an example of “the modern pagan green religion.” They were all wrong. Before this week, pundits were using the encyclical as a proxy to air their own views on climate change and the pope himself—topics that shouldn’t be political, but in the U.S. somehow always are. Here, views on climate change are a decent guide to party affiliation. And outside observers of the pope are prone to viewing his every utterance as either a breath of fresh air or a portentous wind of doom—either way, as a dramatic break from Catholic tradition. When he affirmed that evolution and the Big Bang didn’t contradict church teaching, or asked, “Who am I to judge?” about gay priests, the ensuing heat could easily have contributed to the global warming he decries. Francis’ environmentalism fits perfectly into Catholic history. That includes very recent history. Pope Benedict XVI, often called “the Green Pope,” is cited extensively in the encyclical. His very first homily as pope included a lament that “the earth’s treasures … have been made to serve the powers of exploitation and destruction.” He spoke frequently about the intertwined fates of humanity and nature, and he covered the roof of a Vatican hall with solar panels. Under his watch the Vatican’s scientific arm released climate change recommendations that pressed world leaders to cut carbon dioxide emissions. And before Benedict, Pope John Paul II addressed environmental issues frequently, beginning in 1990. In the U.S., as Mark Stoll writes in his new book, Inherit the Holy Mountain: Religion and the Rise of American Environmentalism, Catholics weren’t exactly the first Christian denomination to embrace this cause. Stoll observes that the vast majority of pre-1960s conservationists were raised in Protestant—specifically Calvinist—traditions. In the 19th century, he writes, almost every single person involved with early parks and forest conservation was within a generation of rural Northeast Congregationalism. And he argues that “there was something about being raised Presbyterian, something that stayed behind after creed and dogma fell away, that made excellent environmental leaders.” Stoll chalks it up in part to early American environmentalism’s roots in a romanticization of small-town life—where, initially, Calvinists dominated—juxtaposed with the ills and evils of the city. Protestant dominance of the environmental movement has been receding for decades, however. In the 1960s the Second Vatican Council, a hugely influential, multiyear conference called by Pope John XXIII, shook up the church aesthetically and theologically: Prayers were revised, Latin was no longer required as the language of Mass, nuns no longer had to wear habits. And crucially for the environmental movement, the conference also reoriented the Catholic agenda toward social justice. Since then, Stoll writes, Catholics have become some of the leading voices in explicitly religious American environmentalism. That includes activists like César Chávez, whose unionization work evolved into anti-pesticide activism, and many lesser-known local leaders. It also includes high-minded theologians, like Thomas Berry, a prominent priest who argued that humans needed a “new story” of the universe in order to reunite with nature. Sometimes that theology has an even more hippy-dippy vibe: California priest Matthew Fox, for example, wrote books with titles like The Coming of the Cosmic Christ: The Healing of Mother Earth and the Birth of a Global Renaissance, and promoted the notion of the universe itself as a sacrament. That emphasis on the human consequences of environmental crises is a running theme for Francis. In the new encyclical, he doesn’t argue that climate change be combated merely for the Earth’s sake, but for the sake of its people, particularly the poor, who bear the brunt of its effects. He describes climate change as having both a human cause and human effect. Although the new encyclical is in keeping with Catholic tradition and with the pope’s long-standing emphasis on the poor, its tone and reach (to 1.2 billion Catholics worldwide, not to mention all the rest of us paying attention) still make it a very big deal. In the Vatican’s complex hierarchy of important documents, an encyclical ranks near the top. And this is not only the first papal encyclical on an environmental topic, it is one that uses urgent language to make its case. “Doomsday predictions can no longer be met with irony or disdain. We may well be leaving to coming generations debris, desolation and filth.,” he writes. “The effects of the present imbalance can only be reduced by our decisive action, here and now.” Finally, the fact that he offers surprisingly detailed assessments of topics like carbon trading and solar power guarantees that it will be discussed not just by believers, but by wonks, activists, and the same circle of pundits who were so eager to opinionate in advance. The 180-page encyclical’s title, “Laudato Si” (translated as “Praise Be”), recurs in a 13th-century song titled “Canticle of the Sun,” written by St. Francis of Assisi, the patron saint of ecology and the source of Pope Francis’ name. In the song, St. Francis offers praise to God through the work of “Brother Fire,” “Sister Water,” and “Mother Earth, who feeds us and rules us.” Francis’ “modern pagan green religion” isn’t so modern—or so pagan—after all. It’s actually very Catholic.